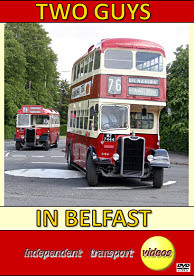 Most enthusiasts of a certain age associate the Belfast Corporation diesel bus fleet with the Daimler marque; the younger generation will more likely think of Belfast as a ‘Bristol’ city. However, during the 1950s, 1960s, and even into the early 1970s, a significant number of Guy Arab IIIs, with locally-built Harkness bodywork, could be found on the city’s streets. Like many operators, Belfast first experienced the Guy Arab during World War II, when seven Arab II models, with Pickering bodies, were purchased. After the war, when new buses were in short supply, the Corporation turned to Guy Motors, which was able to offer a reasonable delivery date, for 70 Arab IIIs, with the Corporation’s favoured Gardner engine. Twenty-five of these Guys were built with 31-seat single-deck bodies, the remaining 45 with 54-seat double-deck bodies. Due to a reduced requirement for single-deck vehicles, that model had a relatively short life, some running from 1950 only until 1958, others being converted to road gritters in 1962/4 with the last being withdrawn in 1970. On the other hand, the double-deckers had a hard life, some surviving the takeover of the Corporation by Citybus in 1973, and running through the early years of Northern Ireland’s ‘Troubles’ until 1975. Fortunately for us, an example of each type has survived into preservation, and on a fair Sunday in June 2009, itv’s cameras were on the streets of Northern Ireland’s capital city to record these wonderful vehicles on their home ground. We see Jonathan Miller’s fine 1950 single-decker, No 286, which had once been the Transport Committee’s coach, and Raymond Bell’s superb 1951 double-decker, No 346, back on the road again after a very thorough ‘overhaul’, at various locations around the city and suburbs, on routes with which they were very familiar. So come with us on a journey back in time and experience the aural delights of the Gardner 6LW round the streets of Belfast.